Another big change in Guernsey which has caused a huge amount of uproar. Once again it reminds us all that people are not good with change. We now have extensive kerbside recycling collections, including food waste, every week but are required to buy stickers to go onto black bags which is for non-recyclable waste. So many people are unhappy about this new system. 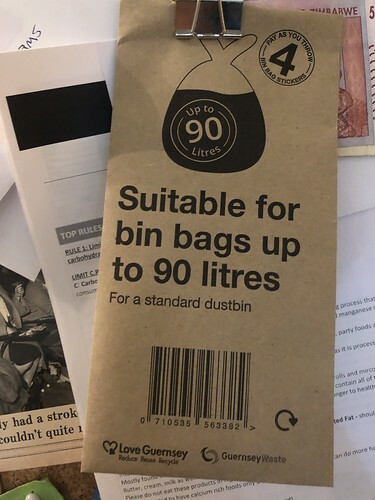 They seem unwilling to recycle more to reduce their costs and they seem to think that it is their right to bin as much stuff as they want without paying for it. We are down to about 1/2 – 3/4 of a black bag a fortnight. Our recycling has gone up hugely. It might be a small change but hopefully it is all positive.